from 200 eV to 1500 eV on a 2 nm thick SiO2 layer on Si(100). At the lowest primary energies (spectra at the bottom) only the SiO2 layer is probed. 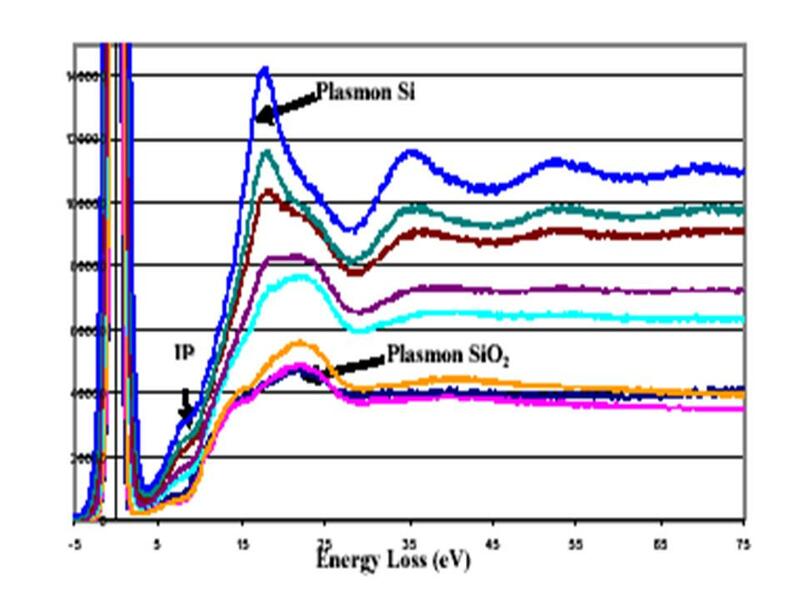 When the primary energy increases (upper spectra), there is an increased contribution of the silicon substrate, with the appearance of an interface Plasmon peak (IPP). 2 - the nanoscale amorphous films which form at the grain boundaries of silicon nitride-based ceramics, when rare earth (RE) oxides are introduced as sintering aids. As these films have a strong influence on the resulting properties of the ceramic, the ultimate goal was grain boundary engineering, in order to optimize the properties of the ceramic by controlling the nanostructure of these films. The workpackages were equally balanced between theoretical approaches (electronic structure calculations, phase field modelling, molecular dynamics…) and experimental determination of the structure and dielectric properties of these amorphous films, by using mainly the recent developments of transmission electron microscopy and related techniques such as transmission electron energy loss spectroscopy (TEELS). Our contribution to this collaborative work was to perform X-ray Photoelectron Spectroscopy (XPS) and Reflection Electron Energy Loss Spectroscopy (REELS) on nanometer-scale amorphous silicon oxide films (WP1) [1,2], and on reference materials in the bulk form, such as oxynitride glasses, with the same structure and composition as the one of intergranular glassy films (WP2). A central goal of the research undertaken was to determine whether Si-O films on silicon could exhibit equilibrium self-selecting thickness and composition that may be systematically controlled by the oxygen activity in the system. A new approach to growing stable Si-O films on silicon was therefore being explored at MIT using a metal/metal oxide (Zr/ZrO2 or TiO/Ti2O3) buffer system to control the oxygen activity (aO2) at extremely low levels. An iterative series of synthesis and characterization experiments between our group and MIT was conducted. The thickness of the films was measured from the intensity ratio from the pure Si and Si-O components of the Si2p photoelectron line, as well as from REELS experiments at different energies (Fig. 1). Experimental results in the synthesis and characterization of films provided compelling support for the existence of stable nanoscale films on silicon, with a thickness in the nm range, corresponding to an equilibrium under the given annealing conditions for each oxygen activity. This potentially offers a new approach to controlled fabrication of interfacial oxides in silicon microelectronics (gate oxides). Two series of oxynitride glasses elaborated respectively at Karlsruhe University (RE-Si-Mg-O-N) and at Oak Ridge National Laboratory (RE-Si-Al-O-N) have been studied by XPS and REELS. 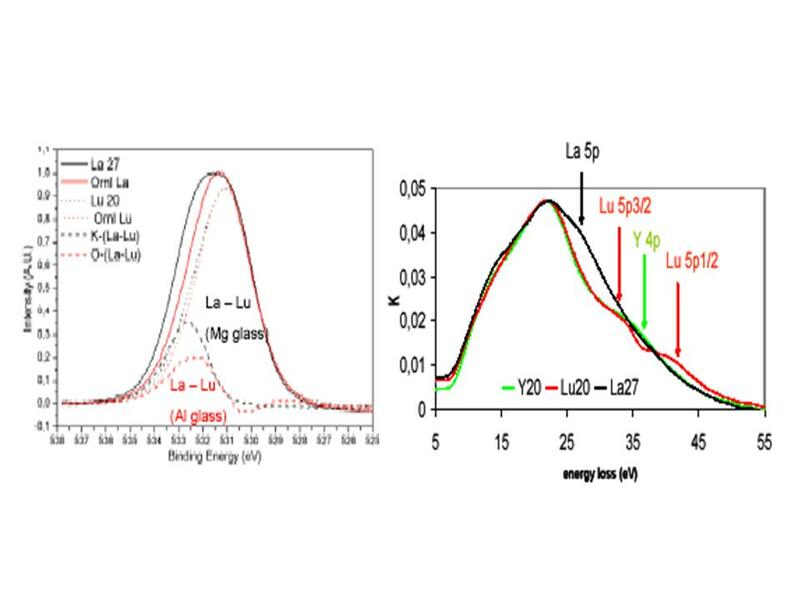 The oxygen 1s photoelectron line-shape reveals a striking difference between the La and Lu glasses: the O1s photoelectron lines of the La glasses are broader than the ones of the Lu glasses (Fig. 2). This broadening comes from an increased contribution of O-Si bonds compared to the Lu glasses. This result is an experimental evidence that Lu has a larger affinity for oxygen versus nitrogen than La, as theoretically predicted by ab initio calculations. La has an increased preference for N environment, compared to Lu, so that more O-Si bonds are expected in the La containing glasses than in the Lu containing glasses. Fig.2 : (Left)Oxygen 1s photoelectron line measured for the La and Lu glasses from Karlsruhe (La27 and Lu20) and Oakridge (ORNL La and ORNL Lu). Also shown are the differences between the O1s photoelectron line of the La glass and the Lu glass in both cases (dotted lines). (Right): REELS single scattering cross sections of the Karlsruhe samples (Y20, Lu20 and La27) obtained after removing the multiple scattering. The results obtained on the Oakridge series (Al containing glasses instead of Mg) are not shown but very similar. DuPont and Pennsylvania University. The overall shape of the REELS single scattering cross section is strongly modulated by the rare earth, the differences arising from the outer electronic levels of the latter. The low energy loss part up to 20 eV is very similar to that of Si-O-N oxynitride, while interband transitions originating from electronic states of the rare earth show up at larger energy losses (Fig. 3). The NANOAM project ended mid 2005, and is currently being followed by the INCEMS project (Interfacial Nanostructures in ceramics : Computational and Experimental Multiscale Studies), centered on interfacial nanostructures at the grain boundaries of SrTiO3 ceramics.